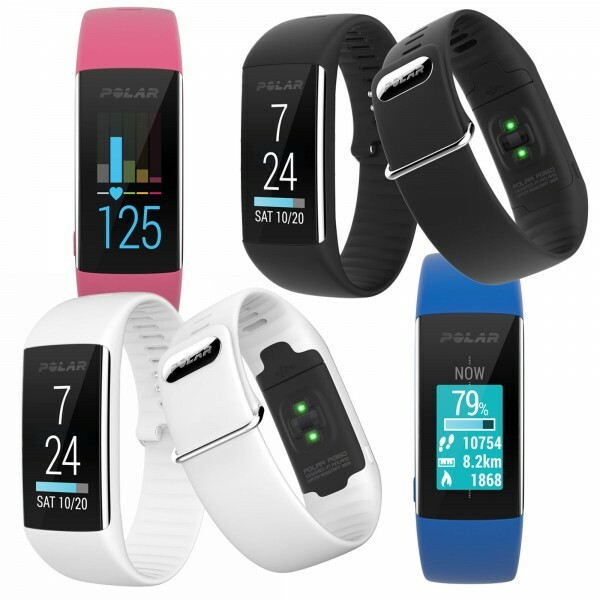 The first fitness tracker of Polar with pulse measuring on the wrist! Optionally, heart rate can also be measured using the Polar H7 chest strap (available as accessory). It "overrules" the pulse measuring on the wrist. The Polar Activity Tracker A360 is the first one which uses a Polar patented technology for measuring pulse comfortably on the wrist instead of using a chest strap. In technical terms, two green LED sensors and a photodiode record the blood flow through the capillaries and your pulse gets thus determined. This type of pulse measuring is as precise as common heart rate measuring with a chest strap. In addition, many athletes praise the higher training comfort - due to the fact that a chest strap is not required. The Polar A360 including pulse measuring on the wrist always informs about your (resting) pulse while doing sports and in everyday life. Wristbands to change, color display with touchscreen, activty guide, Smart Notifications - the activity tracker A360 offers all you need. The Polar Activity Tracker A360 is made of soft silicone and is available in the classic colors white (size S) and black (sizes M, L). Further wristbands to change in green, blue, and pink are available as optional accessory. Using those wristbands, it's always like having a new fitness tracker. All essential tracking information (activity, sleeping behaviour, etc.) can be read on the modern color display with touch screen of the Polar Activity Tracker A360 . An integrated activity guide helps to keep active. A daily activity target and practical instructions are compiled how to achieve the target. Based upon your personal data, the Polar Activity Tracker A360 shows whether and how long you were within the heart rate zone, which is correct for your training target, while exercising. In addition to activity-specific data, the waterproof Polar Activity Tracker A360 is equipped with Smart Notifications; that means information about incoming calls, messages, emails, and calendar reminders are indicated via vibrations by connecting with a compatible Smartphone. The Polar Activity Tracker A360 can be synchronized with the Polar Flow Mobile App via Bluetooth. Via the Polar Flow Mobile App (i.e., Apple App Store ) or the Polar Flow Webservice (www.flow.polar.com), many other functions are possible: from a qualitative and quantitive view of data, training planning, a detailed training analysis, and a sharing function (Facebook, Twitter, etc. ).